The early bird, we’re always told, gets the worm. The internet moves quickly, with new memes appearing and dying so quickly it’s hard to keep track of them all. Some smart companies manage to get in on the ground floor of a new growing trend, which can mean massive amounts of attention and loads of fresh publicity. Of course, it’s not as easy as simply jumping on a popular bandwagon and reaping the rewards. By the time a new online discussion is making headlines, it’s generally far too late to make an impact. This is where agile marketing comes in: small bursts of quickly developed content designed to catch the public mood at just the right time in order to capitalize on a brand new global trend. It’s not always easy to create good, culturally relevant marketing content, which is why it’s so important to be constantly ready for the latest big story to drop. The best examples of agile marketing make it seem as if marketers are actually psychic – why else would they know what’s going to be a popular discussion topic before it actually happens? There are, however, some clever tricks that agile marketers put to use to make sure their content is as topical as possible. Here’s a list of some of the best ways to get the most out of agile marketing. When putting together a content marketing plan, it’s all too easy to make assumptions about the way things are going to go. Life has a habit of throwing curveballs, though, and it’s often the case that a smart-looking marketing plan will end up looking dated after a few weeks (or even a few hours). 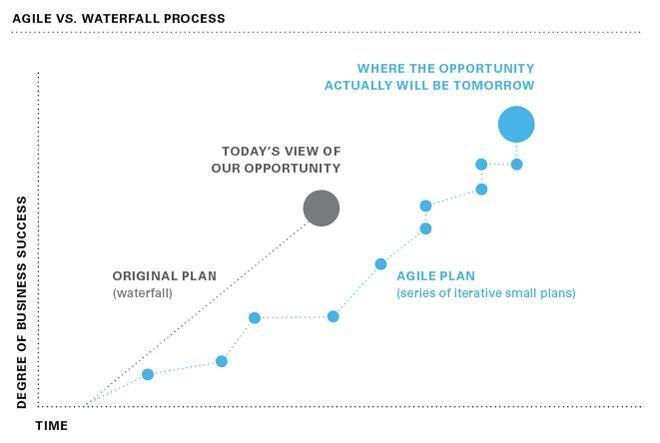 For that reason, because of the ever-shifting nature of agile marketing, it makes sense not to set out plans in stone. Responding to social trends means flexibility, and agile marketing doesn’t work with controlled and deliberately timed plans. At the same time, of course, it’s important to have set goals in mind for an agile marketing campaign – while the route you take should be flexible, not setting a clear destination will lead to a lot of wasted effort. Keeping an eye on the big picture, while allowing for a lot of wiggle room, is the best way to make the most out of a campaign that relies on the whims of internet users. Content marketing can be tricky at the best of times. Sure, there are research tools you can use to predict what topics will be popular (for instance, at Louder Online, we use a tool that pulls insight from Reddit, Quora, Stack Exchange and other sources), but there’s no 100%, guaranteed way of knowing what content will take off and what’ll end up being completely ignored. The agile approach is simple: instead of dedicating a lot of time and effort to a single marketing campaign, content is instead produced and published in small, short cycles or ‘sprints’. Producing five pieces of content quickly means more chances at hitting the right sentiment that people will engage with, compared with a single piece of content that takes a long time to develop. Notice how agile marketing is shown as a jagged line? That’s the result of lots of small sprints adding up to uneven, but healthy, growth. The chart is lacking in numbers and statistics because agile marketing campaigns have a habit of not entirely sticking to a set plan, and because content goals can often be fairly hard to quantify and measure. But this is another reason why short marketing sprints are preferable with agile marketing: if one piece of content falls flat, it won’t be long before another piece is ready to go. Eventually, the law of averages means that something will be a big enough success to outweigh content that doesn’t travel as far. Agile marketing can be a lot of fun, but considering its topsy-turvy nature, it’s not the best plan to put all your eggs in one marketing basket. For this reason, many marketers prefer a 70:20:10 split of marketing resources. 70% of all marketing should be properly planned, carefully organized efforts, with charts and goals and the largest share of the budget. 20% should be programmatic: automated responses based on collected data. Only 10% of marketing should be responsive – reactions to current events and news. The problem with agile marketing is it relies too much on chance, and its effects can be pretty hard to predict. For this reason, smart marketers won’t let responsive, agile marketing take too large a share of the pie and overshadow the effort that goes into better-developed content. Establishing what’s going to be a big talking point online is one of the big challenges of succeeding at agile marketing. It’s not enough to wait until a topic is already popular. Marketers need to see which train is coming before it’s arrived in the station. There’s a certain amount of planning that can go into this. Movie releases, sports events and political debates all tend to announce themselves in advance, so there’s a good bet they will make waves. Beyond this, online rumors and gossip can help point out a potential opportunity before it arrives. A marketer’s job ends up being similar to that of a journalist in this way, following up leads for a potential scoop. The 2013 Super Bowl blackout is often held up as an example of an event that agile marketers made good use of, with many big brands quickly getting a joke out of the situation while the internet exploded with commentary. These marketers were prepared and ready to push out content: they knew the size of the audience that the Super Bowl would attract and they were ready to take advantage of any breaking news that developed during the game. Of course, once a marketing opportunity has been spotted, it won’t stay fresh forever. The sooner a marketer can send out content, the better – otherwise, they’ll end up lost in a sea of commentary. Returning to the Super Bowl (a great example because of the headlines that it makes), Priceline’s parody Vines shows what can be achieved quickly without worrying too much about producing high quality content. How, though, could Priceline produce such clever puppetry in such a short time? The answer is: they prepared in advance. Knowing that the Super Bowl would make a great advertising opportunity, the puppets and backgrounds were produced ahead of time, meaning that it took minutes for Priceline to slap together their Vines when the moment came. This meant that their content was as relevant as possible. Looking again at the examples from the power outage, it’s clear that a few clicks of Photoshop turned stock imagery into topical content. As long as a marketer is prepared in advance with all the pieces they’ll need, throwing together some agile marketing content is a piece of cake. While agile marketing can often be hit-and-miss, there’s no sense in reinventing the wheel every time a piece of content takes off. Savvy agile marketers will take advantage of previous successes and will be keeping their eye on what works and what doesn’t. Just as success in agile marketing comes from constantly watching online trends to spot a potential big hit, making the best of opportunities means constantly re-evaluating marketing goals, plans and strategies to make sure things are heading in the right direction. For this reason, many marketers recommend a ‘scrum’ approach to agile marketing – regular quick, short meetings in which the success of a sprint can be reported and evaluated. Not this kind of scrum (although that would speed up meetings…). Watching how content travels over time is crucial to making sure that an agile marketing sprint is as effective as possible. Agile marketing is all about taking quick action to make the most of fleeting opportunities. This being the case, there is a danger of moving too fast. Such was the case when the British Embassy in Washington posted a somewhat offensive tweet on the anniversary of the burning down of the White House during the War of 1812. Twitter and other social media tools have often left companies with egg on their face when a joke is taken the wrong way, or is simply more offensive than the poster realized. When producing agile content, it’s important to take a second to consider how a message will be received. Many marketers like to pause to ponder the intended user and what they’re looking for before creating content, often through writing short stories from the user’s perspective. This is not just useful for avoiding embarrassment, but also because it helps marketers to ensure that their content is as relevant and poignant as possible. The trick to creating great agile content is working to predict online trends, and then creating fast, fun content before a news story becomes too popular. In order to do this, all aspects of a campaign should be as free and loose as possible, while sticking to an ever-evolving goal plan to ensure that the project has a clear, focused aim. What great examples of agile marketing have you seen? What tips do you have for predicting the Next Big Thing? Share your thoughts and comments below.